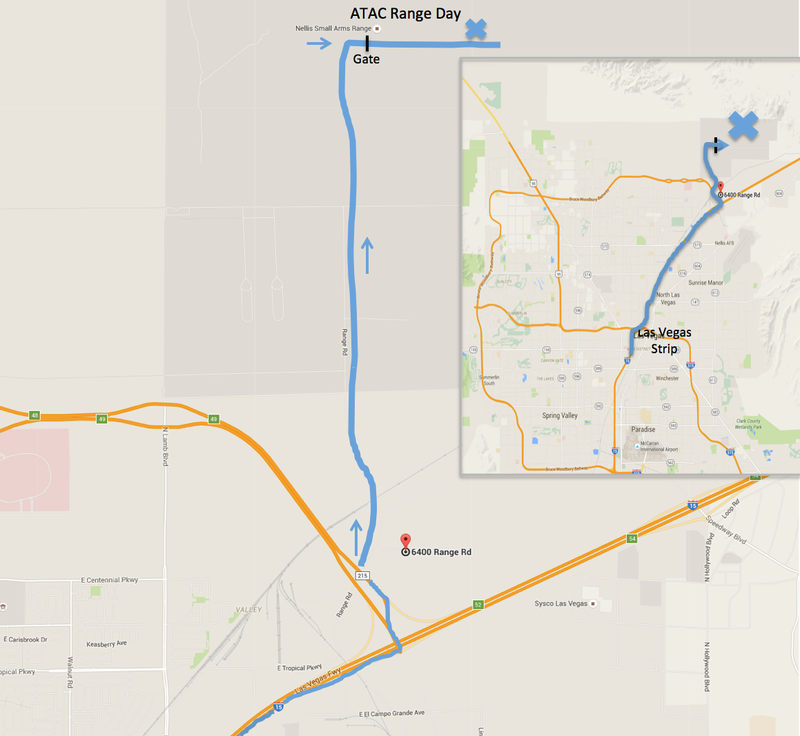 The ATAC Range Day will be relocated on 18 January 2016 to Nellis. Registration will be is now open. The ATAC Range Day™ 2016 is back again for manufacturers, distributors, retailers and others to demonstrated and converse (face time) with end users. Showcasing products and services for unit, department or company purchasing. Also a great time the gathering information/feedback from the end users to assist in product development, testing and general feedback. Admission: Requires documentation of a purchased ticket. Government issued photo identification plus documentation demonstrating trade affiliation. Directions to the range: The Nellis AFB CATM range is located North of the Nevada Army National Guard complex located at (If using GPS punch in this address) 6400 Range Rd, Las Vegas, NV 89115. Continue straight ahead (north) until the road comes to a “T”. Turn right and continue to the gate. MUST pre-register no latter than 1 December 2015. Price increase if received after *Locations are on first come first serve basis. Ammo, Firearm shipping and receiving Exhibitor Memo will be sent to all registered companies via: E-Mail. NOTE: All the ranges are going to be a FLAT rate as of 1 December. 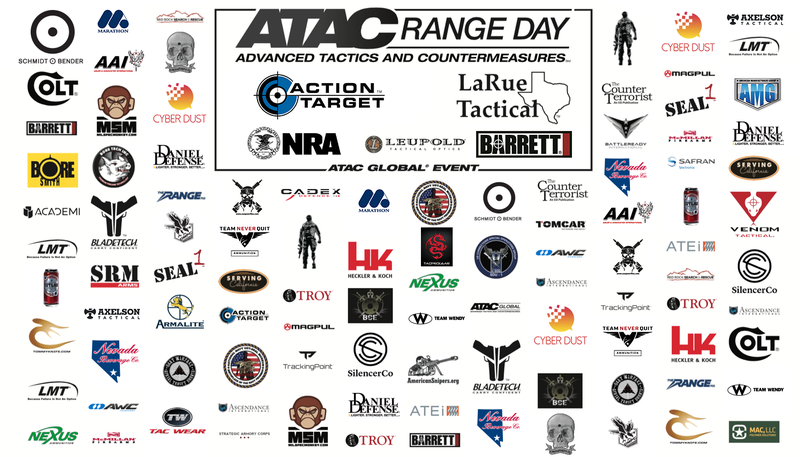 Registration for the 2016 ATAC Range Day is now open. Please click on the below to register FREE. Contractor, Military (active or retired) , Law Enforcement and Trade Representative attend FREE of charge. Range Setup Information: Range setup will begin on Sunday, January 17th at 1200 (12:00pm) and will end at sunset and will restart at 0600 (6:00am) on Monday, January 18th. If prior setup is required, please send us a email (RangeDay@ATACGlobal.com) to coordinate the specific setup needs and times. We will have assigned locations for each registered exhibitors, manufacturer and dealer to set up their range location. Paper targets are complimentary, if needed on the 50yd deep bays. All may and are encouraged to bring some kind of sign that will identify the company being represented at their specific location on the range. Tables and chairs will be available, along with other logistical needs however they will be limited in numbers. Exhibitors, Manufacturers and Dealers are encouraged to bring their own marketing material. Restrictions: Due to aircraft flying overhead and adjacent to these ranges .50 Cal will not be permitted. Shipping and return of weapons, ammo and products? The Range 702 is a licensed FFL which you can send your items in and also pick up. Please maintain your FFL paperwork when picking up and during the range day. *Please put ATTN: ATAC Range Day on all boxes/items being shipped. Steel Targets: Targets are supplied by our Sponsors, LaRue Tactical and Action Targets. LaRue Tactical Sniper Targets are the most reliable and portable automatic sniper targets on the market. They are precisely manufactured from high quality materials, and will survive the toughest environments and the roughest treatment. LaRue has supplied Sniper Targets for elite military/law enforcement sniper training world-wide. LaRue targets are battery powered and will cycle through approximately 1,800 down and up cycles before requiring a recharge. After being hit, the target returns to the upright position and automatically shuts off until the silhouette is again hit and knocked down, resulting in long battery life. LaRue targets are weatherproof and can be left outdoors without damage. Users have reported leaving LaRue targets exposed to the weather for over a year without affecting their operation. Ammunition: Please let us know if you will be needed ammo rather than shipping it? Exhibitors, Manufacturers and Dealers: Gate opens at 0600 (6:00am) on 18 Monday, January 2016 to sign in, set up and other administrative duties. Guests will arrive at 0900 (9:00am). This will allow enough time for everyone to be prepared for the guests. Please remember to bring all necessary BATF forms and documentation. Military, Contractor and Law Enforcement: Free admission and sign up will take place the first week in December, we will keep you posted through e-mail. Shooting Range #1 Sun shade over a concrete pad, max cal. is 7.62 to a distance of 4300 m.
Shooting Range #2 Three-sided building on a concrete pad, max call is 5.56 to a distance of 3600 m.
Shooting Range #3 Concrete pad (uncovered) max cal. is 40mm to a distance of 600 m.
Shooting Range #5 Concrete pad (uncovered), max cal. is 7.62 to a distance of 4600 m. This is a known distance range with berms located at 100 yd. increments out to 600 yds. Food and Beverages: We have a variety of options for breakfast, lunch and food/drinks throughout the day. LaRue BBQ Wagon. We’ll have Brisket, Sausage, Condiments, Chips, Drinks (Water, Sodas, Coffee).